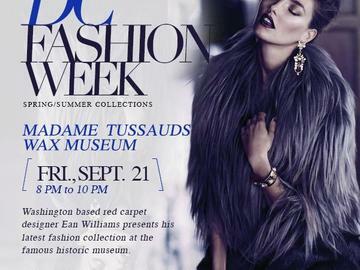 Join us this season of fashion week for a celebrity themed private event, showcasing Ean Williams, founder of DC Fashion Week, award-winning collections. Corjor International couture evening gowns were featured three times in British Vogue Magazine. While his Magnum Underwear/Swimwear has graced the cover of Swerve Magazine and has been spotted on the industry's hottest models including David McIntosh (Jennifer Hudson's Walk it out video), Steven Beck (Vivica Fox presents Black Magic), Nyles DiMarco (Dancing with the Stars Winner) and Keith Carlos (Winner of America's Next Top Model). Attendees of this private event will enjoy the fashion show and a tour of the museum which houses the most famous celebrities & fashion icons such as Beyonce, Rihanna, Brittany Spears, Angelina Jolie, Justin Bieber, Selena Gomez, Taylor Swift and Miley Cyrus. Courtesy of Madame Tussauds Wax Museum, guests will be able to take pictures with historical & A-List celebrities. This will be a night like no other and one any fashionista would treasure for a lifetime.